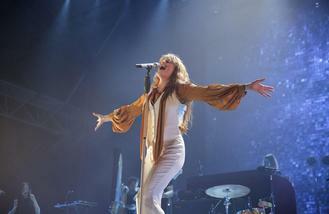 Florence Welch explores her "car crash relationship" in her new musical film 'The Odyssey'. The 29-year-old singer's personal "heartbreak" is documented in the 40-minute short, which she made with filmmaker Vincent Haycock and premiered at London's Rio Cinema on Wednesday night (20.04.16). Florence - who went through agony after splitting from events worker James Nesbitt in 2013 - has described the film as "the car crash of a relationship break-up I was going through" and said making it allowed her to "understand and exorcise" the emotions she felt following the couple, who dated for just over a year, parted ways. The Florence + The Machine frontwoman - who, prior to James, dated Stuart Hammond, but separated from him in 2011 after three years as his girlfriend - encompasses a different "battle" she's been through in each song on the record and for each chapter of the movie. Director Vincent revealed: "'The Odyssey', like the epic poem by Homer, is a journey. It's Florence's personal journey to find herself again after the emotional storm of a heartbreak. Like the layers of Dante's purgatory, each song or chapter represents a battle that Florence traversed and physical landscape that embodied each song or story. It's a metaphorical journey about escaping your demons, confronting yourself and returning to the original Florence, the dancer, the performer, the lover." The film accompanies Florence + The Machine's third studio LP 'How Big, How Blue, How Beautiful' - which Florence has previously admitted is inspired by her break-up from James - and features a new ending to the song 'Third Eye'. The flame-haired singer will stream the film via official website Florenceandthemachine.net from Thursday (21.04.16). Prince had a secret stash of thousands of songs stored away in a vault. Noel Gallagher dedicated 'Live Forever' to Prince at Glasgow's Hydro arena last night (21.04.16). Simon Neil was in a "terrible headspace" when he started work on Biffy Clyro's new LP 'Ellipsis'. Prince was rushed to hospital to be treated for a drug overdose just days before his death, a new report has claimed. Mariah Carey paid an emotional tribute to her friend Prince during her concert in Paris on Thursday night (21Apr16). Singer Meghan Trainor's phone was hacked after she won her first Grammy Award earlier this year. Lil Wayne has paid tribute to former protege Nicki Minaj in a glowing essay for TIME Magazine. ZZ Top have cancelled their US shows after bassist Dusty Hill injured his shoulder. Beyonce is spearheading charity drives on select stops for her upcoming Formation World Tour.